SEATTLE - Supermodels Heidi Klum and Gisele reportedly have a pair of MBT shoes. But you won't see them sporting the shoes on the runway, or a Hollywood celebrity wearing them on the red carpet. It's called the MBT shoe, which stands for Masai Barefoot Technology. The design of the shoe and the sole are based around the way members or the Masai Tribe in Africa walk tall and barefoot on the desert sand. The shoes aren't about fashion, but function. The secret of the shoe is in the sole. It's curved like a mini canoe. Bellevue Chiropractor Carl Jelstrup says that design helps your posture and stride. "The construction of the shoe helps your posture so you gradually start to straighten your posture," he says. "Your shoulders come in, and the gait itself changes into a more primitive gait." Jelstrup also adds that change in your posture helps cure back, hip and foot pain. Add he says the shoe helps build up muscle and can help get rid of dimple fat close to your skin known as cellulite. "When you increase muscular strength, you will invariably increase circulation and thereby decrease cellulite," he said. "Cellulite is simply an inflammatory condition of the circulation system." As the owner of the Seattle store "MJ Feet," Melanie Grimes knows about shoes. She founded the store 30 years ago, and was the first shoe store in the state to sell Birkenstocks. When she heard about MBT's and what they do for your overall health, she picked up the line and started selling them. "It does what no other shoe or exercise routine does," Grimes said. "When you are walking in the course of your day, you are able to be improving your posture and increasing your circulation, and they are rumored to help fight cellulite, that's some of the big buzz." In fact, a British test showed a 50 percent reduction in cellulite in women who wore the shoe for just one month. And that's not all. Grimes says, "It reduces varicose veins, and tends to tone the muscle and increases the circulation and the posture and the main way it does that is by allowing your foot to move completely." But when you buy the shoe, you simply can't just take them out of the box and lace them up. The sole of the shoe changes your center of gravity. So, the shoe comes with an instructional DVD, or you can take a free class to learn how they work. "Not everyone has time, to buy a shoe and take a class and learn how to walk again," Grimes said. Also, the price might be steep for everyone who doesn't want to pay around $250 for a pair. But, Jelstrup says he's never come across patient in pain who has said "no way." "If I have a solution to solve pain, $250 is chicken feed," he said, adding: "In the medical community today, trust me, that's just for shaking the doctors hand and letting him use his stethoscope." Swiss Masai introduces a revolutionary new fitness aid that will change the way most of us use our muscles as well as reduce shock forces to the entire skeletal system. MBT® or Masai Barefoot Technology® is not just a shoe, but an amazing training tool for everyone. Through its multi layered sole MBT® transforms flat, hard, artificial surfaces into natural, uneven ground. Wearing MBT® is like walking in sand. Unlike most conventional training shoes that only support and cushion your feet, the unique uplifting lever spring action of the MBT® sole challenges the core strengthening muscles to be more active. This reactive, more supportive muscle action creates good posture and increases shock absorption for all the joints, significantly reducing musculo-skeletal compression. Walking more upright not only looks good, it makes us healthier and stronger, and we feel younger. The back and joints are strengthened, circulation is increased and breathing is more efficient. MBT® lengthens and strengthens the whole body while standing, walking and in gentle running. Walking, Jogging and Power Rocking in MBT® are popular and fun techniques to develop good posture while getting in shape through aerobic exercise. This is why many call MBT® "the smallest gym in the world". What I do is kick them in the pants with a diamond buckled shoe! We're a health retailer in Winnipeg and many of our customers have had great success with these shoes, it's good to see more Canadians talking about them. I see you've got the link to the UK site posted, I would like to let you and your Canadian readers that you can get the mbt shoes in Canada from Aviva as well. New sweepstakes to help jump start your fitness routine. The 'Walk Fit Kit' Sweepstakes features popular products like MBT shoes, High Gear Pedometer, Bodytrends Fitness Ball and the highly acclaimed Denise Austin Powerbelt. Tequesta, FL — The Walker’s Warehouse is excited to announce the launch of the ‘Walk Fit Kit’ Sweepstakes featuring a pair of mbt shoes and valued at over $400. The contest runs through the end of March. The Walk Fit Kit, featuring MBT Shoes, is a perfect solution for those trying to jump start their fitness routine and lose weight. The sweepstakes is highlighted for use by fitness walkers, but many of the products can be used for other fitness activities such as jogging and aerobics. The wide range of products make the sweepstakes package a versatile fitness solution. The Walk Fit Kit includes: 1 pair of MBT Shoes, a High Gear Pedometer, The Denise Austin Powerbelt Walking System, a Bodytrends Fitness Ball, and Kathy Smith Music CD’s. "This is a great starter kit," said Tom Hickey, CEO of The Walker’s Warehouse. "The kit contains all the items one will need to establish or reestablish their fitness routine, lose weight, get into shape and feel healthy. We love MBT shoes and the other product selections and feel, with the customer feedback we’ve received, that this package is something people both want and will use." 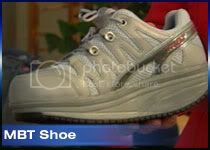 The highlighted product in the kit is the fitness walking solution called MBT Shoes. Inspired by the Masai Tribe, MBT Shoes(Masai Barefoot Technology) is a range of footwear which reestablishes our natural conditions of standing and walking. Establishing these natural conditions with MBT Shoes offers high potential for health, beauty, sports, fitness, and therapeutic applications. To find out more about the Denise Austin Powerbelt, visit http://www.powerbelt.com. You can buy the MBT shoes at Amazon. Just click the MBT shoe on the right sidebar of this blog! Happy shopping! They are really great! I was dubious at first but intrigued and when i went to the store to try them on - the sales guy was wearing them. He told me he rarely wears any other shoes. I winced as I paid the high price but now I want another pair. They make you want to walk! I waitress and use them for work and now I want another pair for hiking and walking. Ah well, Christmas is coming. I've worn them for 6 months. Here's a few practical comments. 1) They're quite heavy. If you want to do power lifting everywhere as well as power rocking you'll be happy with these. 2) The curve drops at the middle of the shoe so that you're liable to trip constantly if you don't lift your feet high on steps, over branches, etc. 3) Sometimes you may want to just stand. Having to always balance on a soccer ball, so to speak, can get old. 4) They look like orthopedic shoes. They will never be fashionable. 5)They are well made and durable. I have only worn my MBTs for a couple of weeks but I put them to very heavy use, 1 full week at Disney World. I have hip and low back problems. Within a day of wearing these, I had no hip problems and my legs didn't feel tired. the only problem was a rubbing from the suede on my big toe. I don't think my sandals are ugly at all and never get looks. I don't find them heavy when wearing them although they clearly are heavier shoes. I just wish I could wear them to work. For Dan (the previous comment)--I wonder given your negative review that you continue to wear the MBTs at all. Very strange. MBT's 5 layer sole with its unique "Masai Sensor" reestablishes natural rolling motion of walking & standing, improving posture, toning muscles, reducing stress on knees, hips & back and increasing circulation and respiration. If you want to buy MBT shoes online, just like going to a shoe store it is very important that you are fitted correctly with the MBT. Ideally you want some room for your toes since the construction of the MBT shoe is exaggerating your toe-off movement. At the same time you want both of your feet to be securely locked into your MBT shoes. Since the function of the MBT is to enhance and smoothen transition within your entire foot-strike activity, this causes more movement (and need for precise fitting) than in most regular shoes. If you are interested in trying MBTs, but have nowhere to go to try them on, the first challenge is to get an accurate measurement of your feet in "European Size" and always use this as your standard for fitting MBTs. For accuracy it is always best to use the sizing of the country of origin (MBT's are engineered and were developed in Switzerland). So how can you get your correct fit if you are not able to visit a shoe store? How can you prepare yourself to buy MBTs online? Very simple -- www.FeetFirstFitness.com outlines some very basic but excellent online MBT fitting techniques that guarantee you will be fitted with the MBT as professionally as is possible (prior to actually trying on the shoe). Last year our personal friend and inventor of the MBT, Karl Mueller, departed from his MBT kingdom in order to pursue other inventions and creations. At first we felt that this would not at all have an impact on the MBT product, which seemed to be at such a high quality and outstanding level. Nor did we feel it would impact the company's business units as Karl had partnered his brand with many excellent people worldwide. On the business side we were wrong: immediately MBT's US subsidiary in Idaho (our direct business partner for the brand) was completely reorganized and new managers were hired, most of whom had made their previous careers in the low end and discount shoe businesses. Their first move was to completely change the MBT product line: out with the old and in with the new. And as a consequence at the end of 2007 we ran an amazing sale on the dropped MBTs and we thank many of our customers for their enthusiastic participation and business in this sale of our existing inventory. In particular, starting in November 2007 we began receiving a plethora of complaints from customers that their MBTs were wearing out -- of the outsoles and collapsing Masai sensors -- already after only three weeks of usage (attached is a picture study of the outsole of the MBT Sport comparing the older and the newer product executions). Since then we have also wear-tested many of the new Spring 2008 MBTs and, also unfortunately, the results have been extremely poor: POOR FIT, COLLAPSING MASAI SENSOR, PREMATURE & COMPLETE OUTSOLE WEAR, LACK OF STABILITY, EXTREMELY HEAVY... And as a result somewhat reluctantly, we have now decided to no longer sell the MBT in our store until (hopefully) the former quality of this once-great-product has one day been completely restored. Just as we had been so enthusiastic in communicating and promoting the MBT brand when it was in its prime, we hope you understand our decision that we can not support any of our former efforts, convictions and recommendations based on the poor product quality issues present in almost all of the current MBT products. Quite frankly, there is no way we could recommend & sell the MBT in its current execution FOR OVER US$ 200!!! and expect our customers at all to continue to take our advice and recommendation seriously. To conclude, it appears that even more significantly than driving the MBT creation and innovation, Karl Mueller, during his time at the company, was successful in maintaining the MBT shoe's high execution standard of quality production. With him no longer involved, we are convinced that the MBT is no longer what it once was... and that anyone who has been as involved with the MBT as closely, as thoroughly and as long as ourselves is similarly in complete agreement with our position. After reading Oct 18/08 in The Globe and Mail, Canada's national paper, about the MBT Tambo Boot, I was very excited and wondered where to buy these locally. I am so glad to have found your site. I learned that MBT shoes exist. I appreciated Dan's practical comments and didn't think them negative, just practical. I also very much appreciate the history of Karl Mueller and the deterioration of quality issues. I will research further, and possibly not make a purchase based on these comments. Thank you. I appreciate the comments about the decline in quality, but I am a bit confused as to why this was left anonymously, particularly since you claim to be a retailer and "personal friend" ... this is exactly the type of comment that MUST have a name attached in order to generate validity. How do I know you aren't simply a competitor slinging mud? I bought my MBT's about a month ago. I love them and find them quite comfortable. My foot pain has decreased however, in the last few days my left knee has been "giving" out and twisting giving me great pain. I am not sure if it is because of the shoes or just what? I have never had a problem before with my knees. I wonder if it is the change in the muscles causing problems, I don't know if I should continue to wear them. I am going on a cruise in a few weeks and am quite concerned that my knees will not hold up. There is plenty of walking on the ship alone not counting the excursions in port. Suggestions? Advantages and disadvantages of MBT Shoes. Surprising findings. Some good reading in here and some interesting facts I was not aware of. I bought my first pair of MBT from Yodgee Footwear in Melbourne, Australia. This was recommended to MBT Australia as they are an accredited seller. I wasn't sure if MBT's were the right shoe or not for me initially. I play a lot of sport and would suffer sore Achilles and other tight muscles. After chatting to the staff and going through the fitting procedure I decided to give then a go and I have to say I have been very pleased with the results. My leg muscles have definitely adapted and become stronger as a result of wearing MBT's. I have also found I'm not suffering from injury as often. I don't wear there when I train or play sport.. rather as a recovery tool and I'm very happy I did. All words here owned by the poster. Put your best shoe forward.